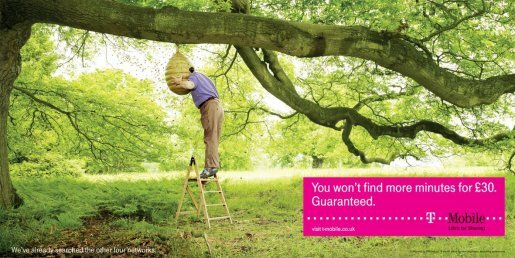 T-Mobile is continuing in the “Search for Minutes” line with a print advertising campaign featuring the line, “You Won’t Find More Minutes for 30 Pound”. “We’ve already searched the other four networks”, the ads say. The print campaign was integrated with two television spots, featuring an archaeologist on a dig and a spiritualist at a seance. 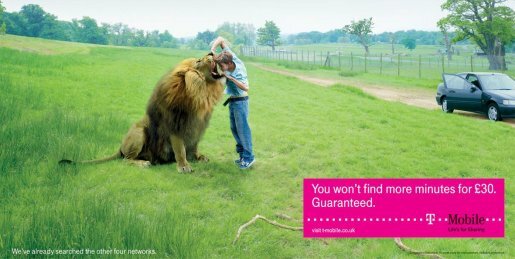 New and existing customers on T-Mobile Solo and Combi price plans of £30 were offered a commitment, “Just ask, and T-Mobile will match or beat the amount of minutes offered on a like-for-like basis by the other four operators”. 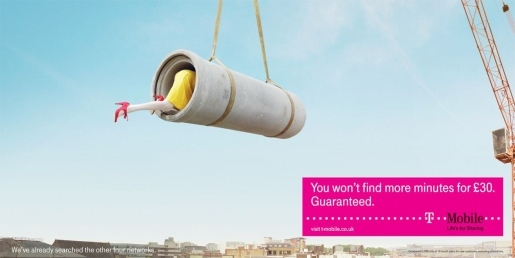 Five print advertisements, used in press and outdoor settings, show customers looking for deals inside a lion’s mouth, a pipe being carried by a crane, a beehive, a fortune teller’s tent, and a cow’s posterior. The Minute Search campaign was developed at Saatchi & Saatchi London, by creative directors Paul Silburn and Kate Stanners, creatives Dennis Willison, Suzanne Hails, Howard Green, Pablo Videla, planner Gareth Ellis and account handler Sarah Galea. Photographer was Nick Meek.